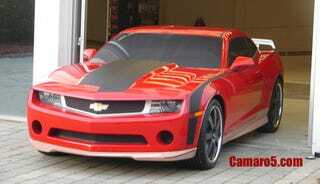 2010 Chevy Camaro Gets Kitted Up? OK, you thought those purported press photos of the new Camaro convertible for 2011 were wild? Check these out. These shots, again from the always-willing-to-market-themselves folks at Camaro5, appear to be of the new Chevy Camaro we saw teased in that GM accessory video yesterday afternoon — body kit, ground effects and all. While we're still not sure of the veracity of these shots — especially the photo of the Camaro from behind with the chrome on the wheels all a-gleamin' — they look somewhat credible. Now as to whether or not they look good? That's up to you, the commentariat. So — what say you? Is it real or is it Adobe-rex? 2010 Chevy Camaro Convertible Production Press Shots?